Last week, the world got its first look at the individual Power Rangers Movie Zords, leaving fans to dissect the five Dino’s and figure out how they combine into the mighty Megazord. 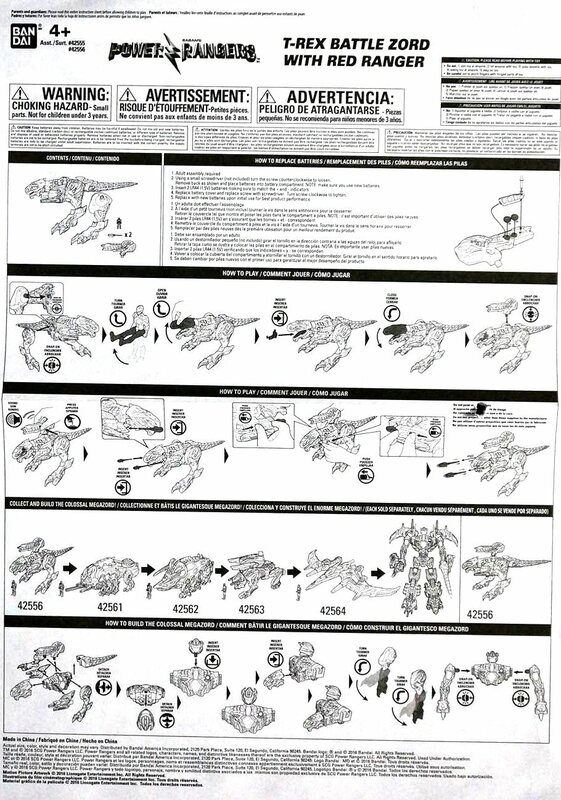 With the first Power Rangers Movie toys hitting stores on December 2, one of those toys, the T-Rex Battle Zord, comes included with instructions on how the Megazord combination works. 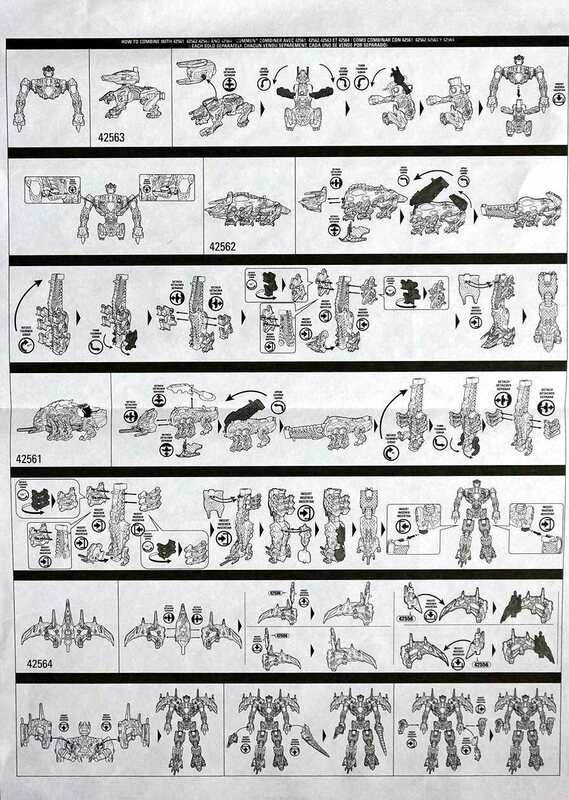 Below, fans can check out both sides of the Megazord’s instruction manual, and click the links provided for enlarged versions. Fans can also check out a video overview of the instructions by clicking here. Piloted by Jason the Red Ranger, the T-Rex will serve as the Megazord’s torso and arms. The T-Rex also supplies half the firepower on a Megazord loaded with weaponry. The tail of the T-Rex detaches to create one of the Megazord’s swords, and the T-Rex’s cannon attaches to the right arm for addition firing ability. Piloted by Billy the Blue Ranger and by Zack the Black Ranger respectively, these two multi-legged Dino’s become the Megazord’s legs. The Triceratops forms the Megazord’s left leg, as it did on the original Mighty Morphin’ Power Rangers TV show, and the Mastodon becomes the Megazord’s right leg. Trini the Yellow Ranger’s Zord brings the Megazord together as its centerpiece body part. Becoming the hips, the Sabertooth Tiger connects the torso and legs into one single unit. The Sabertooth Tiger also adds to the Megazord’s wide array of arsenal by supplying a massive blaster-type weapon that can attach to the Megazord’s left arm. The final Zord, Kimberly the Pink Ranger’s Pterodactyl, becomes the wings on the Megazord’s back, giving it a presumed flying ability that the original TV show Megazord never had. The Megazord also appears to sport dual sabers, with the head of the Pterodactyl also detaching to serve as the second. A cornerstone of the Power Rangers franchise, Zords have long helped to back one of the key morals in Power Rangers history: that when five individual components come together as a team, they can form something even greater and more powerful. And with the Power Rangers Movie sporting a “Together We Are More” tag line, this Megazord appears to represent the same. The five toys pictured above will each be sold separately, and fans who purchase all five will have the chance to form a 2 foot tall Megazord, the largest ever produced by Bandai America. Be sure to stay with Power Rangers NOW for all the latest Power Rangers Movie news as the feature film hits theaters on March 24, 2017.